That was Princeton head football coach Bob Surace last year after his Tigers came close to beating the Mountain Hawks at Murray Goodman last season, but coming up just a bit short, 17-14. 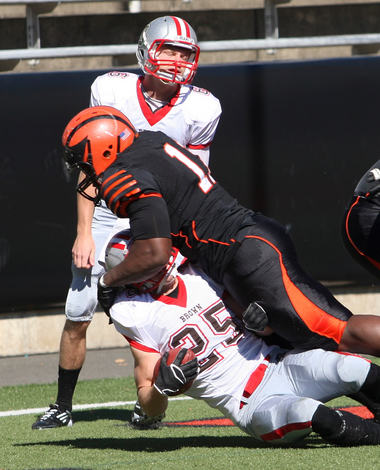 Princeton’s strong effort that Saturday last season was an indicator that the Tigers, who were 1-9 in 2011, were poised to be a much better team in 2012. After a 5-5 season, where the Tigers beat Harvard and Yale – their two biggest rivals – they enter 2013 with goals a lot bigger than a “good effort against Lehigh”. Their goal is re-establishing themselves atop the Ivy League, with their first stop hosting a nationally-ranked Mountain Hawks team on national television. Below the flip, enjoy this week’s “LFN Players of the Week” and a Two Minute drill on the quotes from this Saturday’s game. I’ve decided to break out the sneak peek at Princeton into a different blog post – for reasons that will be come clear. Last season, Lehigh’s defense was expected to help carry an offense a little as a new offense learns the ropes. This time around, though, it’s a completely different situation. Eight starters depart last year’s starting squad, including key members of both the defensive line and defensive backfield rotation. Oh yeah, and LB Billy Boyko, an undrafted free agent signee by the Raiders in the offseason, graduates as well. It’s not like the cupboard is bare by any means. But, man, eight starters? While the expectation is that Lehigh’s offense will proceed just fine, the defense just has so many departing seniors that it’s worth asking the question: what’s the expectation for 2013? The season will start in 6 days! At no.6, we look at junior S Damien Brown as our highlighted Lehigh football athlete today.